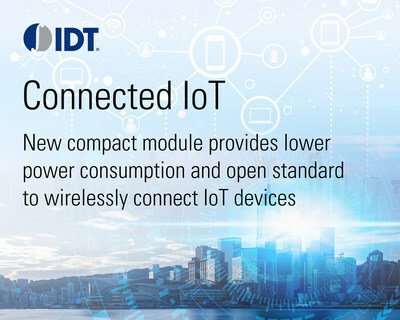 IDT Introduces New 6LoWPAN Module for Wirelessly Connecting IoT Devices | Integrated Device Technology, Inc.
SAN JOSE, Calif., Nov. 12, 2018 /PRNewswire/ -- Integrated Device Technology, Inc. (IDT) (NASDAQ: IDTI), today announced the availability of its new ZWIR4532 connectivity module, which is FCC certified and provides the critical and secure 6LoWPAN wireless connectivity to link devices to the Internet of Things (IoT). IDT also provides the optional IDT® SensorShare™ firmware, a 6LoWPAN open standard stack that communicates natively with IPv6 over IEEE 802.15.4 radio links, which has no associated license fees or royalties, to enable customers to focus on their applications without the burden of building IoT solutions from the ground up. The low power consumption and small form factor of the ZWIR4532 module – approximately half that of other ZWIR45xx modules – makes it ideal for embedding into a variety of IoT-connected consumer, industrial and medical devices with space constraints, including home automation devices, factory automation monitors, environmental sensors and LED lamps for smart city applications. "Product designers can create a wide range of securely connected IoT devices thanks to our new ZWIR4532 module, which combines our proven 6LoWPAN wireless connectivity and SensorShare firmware that give it many advantages over competitors' modules," said Sailesh Chittipeddi, IDT's executive vice president for global operations and chief technology officer. "The ZWIR4532 is an example of our commitment to providing complete solutions that address the need for secure IoT connectivity, and expand on our popular ZWIR45xx family of modules." The ZWIR4532 is a complete and full-featured IoT connectivity module, incorporating an Arm® microcontroller, a sub-Gigahertz radio transceiver and optional license-free IDT firmware download. It is an excellent solution for IoT connectivity thanks to its support for native communication with computers and mobile devices through IPv6, the ability to create self-healing ad-hoc mesh networks for covering large areas and long ranges, and secure connectivity based on open standard security protocols. The module is also ideal for battery-powered devices as its low power requirements maximize battery life. IDT's ZWIR4532 6LoWPAN wireless IoT connectivity module is currently available. Visit idt.com/6lowpan for more details or to place orders, or contact your local IDT sales representative. © 2018, Integrated Device Technology, Inc., SensorShare, IDT and the IDT logo are trademarks or registered trademarks of Integrated Device Technology, Inc., and its worldwide subsidiaries.Arm is a registered trademark of Arm Limited (or its subsidiaries) in the US and/or elsewhere. All other brands, product names and marks are or may be trademarks or registered trademarks used to identify products or services of their respective owners.